Eleven times. Roger Deakins has been nominated for the cinematography Oscar eleven times and is yet to win. Through his brilliant lens we have seen Andy Dufresne experience freedom in the rain. The pure evil of Anton Chigurh lurking in the shadows. A neon glow illuminating James Bond in Shanghai. The flashing lights of a squad car ominously cast over the windows of a suspicious motorhome. Eleven times and nothing to show for it. It isn't that Deakins always fills our eyes with images of pure beauty that make us feel like we are speaking to God through his photography (think Lubezki's work on The Tree of Life). It's not his job to make every color pop and every frame sizzle with electricity. It's to shoot what best suits the material, and Sicario is a perfect example of how perfection doesn't always have to be perfect. The gritty textures of the sets, the way the dust lingers in the air. The spectacular night vision sequence or the way light (or the lack of) makes an already claustrophobic setting feel even tighter and more terrifying. I have no idea if Sicario will be Deakins first Oscar win. Sadly I doubt it. Eventually, though, the man needs to hold the damn trophy. His work is breathtaking because of how it functions as almost a vital character that makes the story go. It's very talented people like Deakins that make good films great. Another one of those really talented people is director Denis Villeneuve, a man who is not only yet to make a bad film, he is yet to make even just a good one. The brilliant craft of a horrifying truth in Polytechnique. The balance of a culture rooted in hatred yet a relationship rooted in love in Incendies. The anguish of missing children and just how far a parent will go to bring them back in Prisoners. The mind melting intrigue of a man who spots his exact twin in a film during Enemy, and now Sicario. A drug cartel action thriller bursting at the seams with tension, a film so unnerving it literally ended up being an edge of your seat experience as with each passing minute I leaned in a bit more. I became more immersed, my mind racing to figure out what might happen next. My body twitching as each bullet explodes from its chamber. Throughout his career thus far, every stroke of the brush by Villeneuve has made me swoon. I might be guilty of getting too worked up by a hot new filmmaker impressing me once, only to end up recognizing his limitations going forward, but what we have here is five feature films and five home runs. I don't need a cast or a plot synopsis or a trailer to convince me to see the next Villeneuve film. Just tell me when and where and I will be there, expecting nothing short of extraordinary. Sicario tells the story of an FBI agent named Kate Macer (Emily Blunt) who is hand picked to join a government task force lead by a man named Matt Graver (Josh Brolin). They have been assigned the difficult and ultra dangerous job of bringing down a Mexican drug lord named Manuel Diaz. Along with Matt's mysterious partner Alejandro Gillick (Benecio del Toro), their first stop is Juarez, Mexico, and the brutality of that region is on full display, including a masterfully filmed sequence involving their caravan of SUV's getting stuck in a traffic jam, with any car around them potentially filled with men armed and ready to kill. The screenplay from Taylor Sheridan wastes very little time with exposition, instead always moving forward and living in the present rather than the past. We find out some backstory of characters but it is handled swiftly, only painting the picture we need without overdoing it and thus the film never drags. It's a tight and focused script that suits the amazing visceral experience from Villeneuve and Deakins, and all mixed together it makes one of the best films of 2015. The message of Sicario is a simple but important one, and it is the answer to the following question: who is winning the drug war? What Sheridan and Villeneuve are portraying is the truthful answer. No one is winning and no one will win. The drugs and cash are still flowing and the bodies are still piling up no matter how many hours are put in by the authorities trying to stop it, and the only hope we have is to contain the problem rather than eliminate it. "You will not survive here. You are not a wolf, and this is the land of wolves now." A tense, exhausting cinematic experience that you absolutely need to see. 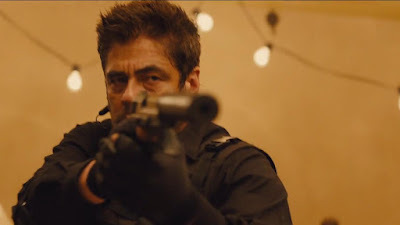 Sicario is outstanding. Del Toro stole the whole movie for me, every time he was on screen I was pulled to the screen. My favorite part of the movie was when he confronts the big drug king pin in his home, and I had chills when he's like "lets talk in english so your kids dont listen in" and man this film hits the characters psychologically! It's funny, during the actual experience I don't think I ever truly thought about how great Del Toro was in this, but upon reflection I was blown away by his presence and how vital he was to the entire thing working. That scene with the king pin, like you said, the part about speaking english...chills is right. So wonderfully executed, that entire sequence. This entire film. OOO, that was good. The scene with the caravan of SUVs was intense. I enjoyed how you felt the confusion of Blunt's character in that scene, not knowing what was really going on. Yes sir! One of the best scenes from a great film. It's the subtle stuff like what you mentioned, that you could feel confusion without having to make it so overt and obvious. Villeneuve is just an ace director, very excited for his Blade Runner sequel.